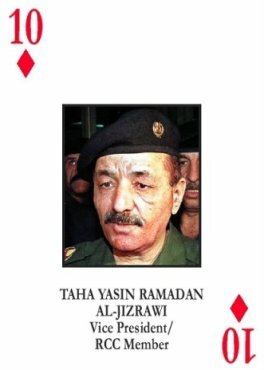 On this date in 2007, Saddam Hussein‘s former Vice President Taha Yassin Ramadan was hanged for helping conduct the 1982 Dujail Massacre of Shia Iraqis in revenge for an assassination plot against Saddam. He was noted for his role in orchestrating Saddam Hussein’s terrifying 1979 internal purge. While the first operations of America’s 2003 invasion took place on March 19, it was March 20, 2003 local time that the land invasion proper commenced. That made Ramadan’s execution a fourth-anniversary gift to the occupier’s preposterous foreign policy blunder. Which was all too bad, since Ramadan had also floated a 2002 plan to avert conflict: have Saddam Hussein fight a duel with George W. Bush. Of course, the offer was declined. “An irresponsible statement,” replied the spokesman of a government that was at that moment engaged in a mendacious campaign to justify its coming aggressive war with creative fables about Iraq’s nuclear capacity. “I don’t know anything about industry. All I know is that anyone who doesn’t work hard will be executed.” Sounds like a great slogan for a Despair Inc. demotivational poster!